When the consciousness is awakened with the light of truth, if only for a fraction of a second, its radiance never entirely withdraws but filters quietly into our everyday life, for the most part unnoticed. -- G.F.K. The theme of wheels within wheels is an electric metaphor that prods memory, imagination, and intuition into a virtual picture-making activity. The first image that popped up for me was an expansive cosmic setting of consciousness itself. Contemporary astrophysicists are now recognizing something they call the "Great Attractor" (1) -- a yet to be perceived wheeling superforce of superclusters of galaxies that flow and gravitate towards it. Within superclusters there are swarming curds of smaller clusters of galaxy structures which, in turn, are teeming with countless star-lives. Each starpoint, moving and staying like white water, is a hub to its own solar system, from spent ones like supernovas to oncoming protoplanetary disks and their evolving humanities -- humanities very capable of looking back up into their heavenly roots and also down into the infinitesimal eddies of the fluid forces of atomic, subatomic, and quantum worlds -- worlds within worlds ad infinitum! From within this mind-filled world of consciousness and in our inherent stages of evolution, we have come to realize that we are, as in Anne Morrow Lindbergh's poem, The Unicorn , "horizontally in captivity yet perpendicularly free"; free to explore and invent our way through this labyrinth of light-forces we call the electromagnetic-photon spectrum. This is a spread of radiant energy/matter that conceptually ranges in wavelengths from zero to infinity. Within the last 200 years scientists have divided it into seven basic regions: radiowaves, microwaves, infrared, visible light, ultraviolet, x-rays, and gamma rays -- waves within waves! The specific wheel I want to discuss is the color wheel because color excites, shapes, and promotes life as we can know it. Everything manifested is borne and sustained by this electro-magical web of rays. The color wheel is our soul's mode of transportation through this underworld of radiating life-forms. It is a unicycle, a concentric glory that is at once a self-balancing dynamic of simultaneous contrasts and harmonies of structures, apparent and yet occult until we approach this wonder-wheel with curiosity and experimentation. The inventive experimenter Isaac Newton flayed our crystalline thin air and exposed the hitherto occult prismatic-light spectrum, setting in motion an avalanche of scientific inquiry and literary metaphor. Further it was the resident genius in Newton who intuitively and profoundly proclaimed: "For the rays to speak properly are not coloured." If the rays are not coloured, what are they? . . . we might describe them as carriers of information -- information about the disposition of an object to reflect this or that sort of light more copiously than the rest. Color within color (light within pigment or matter) is but one of many prizes held within this Wheel of Fortune -- our spectral glory. 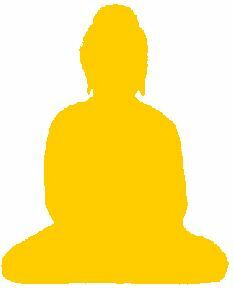 Here sits a Blue Buddha for you: look at the center of the Buddha for thirty seconds, then shift your gaze to the right.